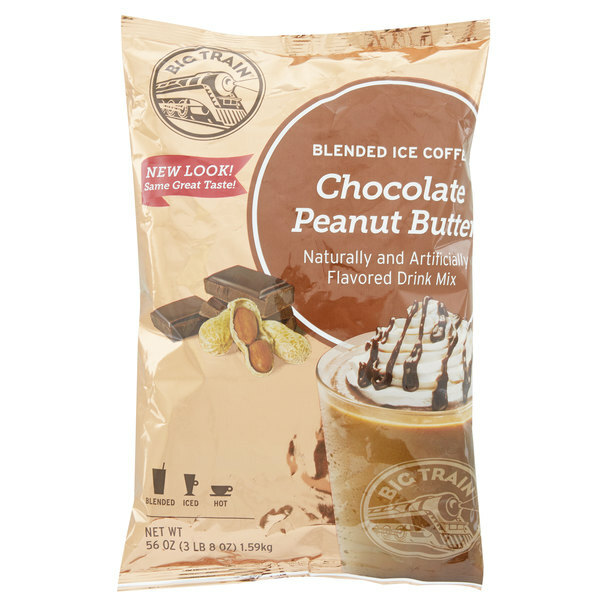 Offer irresistible flavor in your coffee beverages with this Big Train chocolate peanut butter blended ice coffee mix! With a name symbolizing strength and constant motion, Big Train has expanded into a global foodservice brand you can trust with a large number of diverse products to choose from. Big Train has become a leader in the specialty beverage mix industry, delivering easy-to-make and consistently-delicious products. Made with peanuts, cocoa powder, and smooth Arabica coffee, this drink mix allows you to serve drinks that taste like a gourmet caffeinated peanut butter cup! 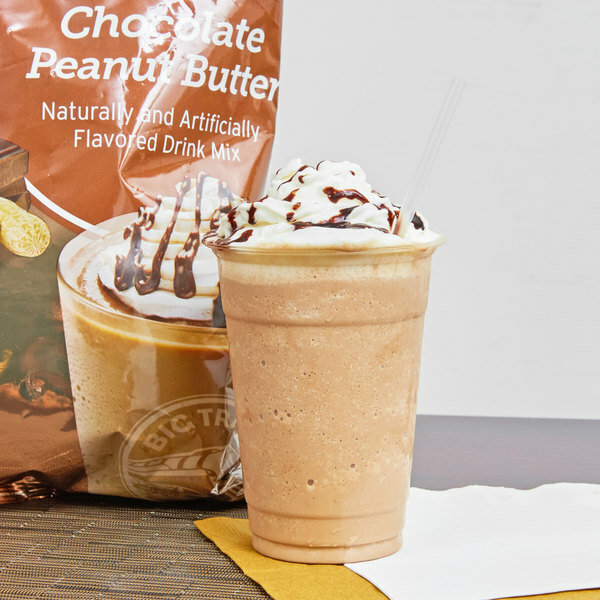 Chocolate and peanut butter is a classic pair of sweet flavors that's sure to make for popular frappes or flavored mochas. Give your guests an energizing caffeine boost with signature coffee drinks that can be served hot, iced, or blended. Featuring a rich, invigorating taste your guests are sure to enjoy, this drink mix is gluten free, trans fat free, and contains no hydrogenated oil. I am a big fan of the Big Train mixes but this peanut butter OMG! The sweet creamy peanut butter flavor has got me so addicted. This coffee mix is delicious and satisfying. I have never had any coffee flavoring that tasted as good as this does. I have used is as both a blended beverage and added to my hot cup of coffee in the morning. My morning coffee tastes just like a peanut butter cup! My blended ice coffee drink tastes as good as anything I've gotten at Starbucks. This is definitely worth buying. I look forward to trying other flavors. with any of the big train mixes, this is a hit for our customers, creamy easy to make and so good. great size and great price. Love these peanut butter ice capps. Rich, great flavor, and blends easily. I mix it with almond milk and it's even better! Will definitely be reordering on a regular basis. The Big Train chocolate peanut butter blended ice coffee mix is amazing and tastes just like a reese's cup. The peanut butter is smooth and subtle and compliments the chocolate well. A favorite among law enforcement here..add that double shot of espresso with this frappe..blend and voila..the perfect drink. Everytime its delicious and highky addictive to all! Umm peanut butter heaven!!! Talk about the best liquid form of peanut butter out there! They got this one spot on for just the right amount of chocolate and peanut butter flavor! Big Train is known for it's great coffee mixes. 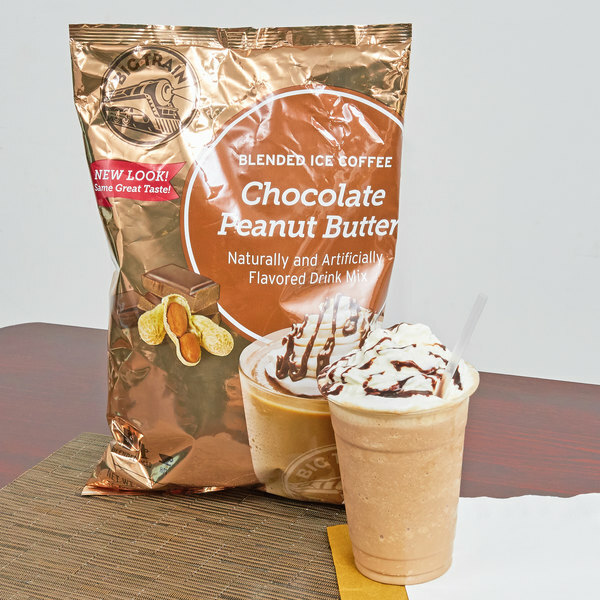 The Peanut Butter Mix is perfect for a cold sweet drink. Definitely should be in everyone fridge. Received our Chocolate Peanut Butter coffee mix and we use it at our Barista station. This is one of our new addtions to our coffees. We hope this new flavor brings a delight to our customers pallette, and they return for more. We plan to mix with ice cubes, milk and 2 scoops blended and served.